Ashgabat: Ahal FC recorded their first-ever victory in the AFC Cup Group Stage as Gurban Annayev scored two goals including a last-minute winner to give the Turkmenistan Cup holders a 2-1 win over last year’s runners-up Arbil at Ashgabat Stadium on Wednesday. Annayev (pictured left) saw his 27th minute opener cancelled out shortly afterwards by Luay Salah but the Iraqi side could find no response when the midfielder fired home the winner from close range in the closing minutes of the game. The result saw Ahal join Arbil on three points in Group C, three points behind group leaders and defending champions Qadsia SC, who hosted Tajik champions FC Istiklol later on Wednesday. “We are happy with the result,” said Ahal coach Boris Grigoryants. “I am satisfied how the team played and how the players gave their best on the pitch tonight. We began the game with some good attacks and won it with the two goals by Annayev. “It’s always good to see your players try until the last minute. I hope this victory will give us more confidence and that we try to continue to give good performances in our next games. The hosts began the game in lively fashion and Altymyrat Annadurdiyev had a shot blocked by Hardi Tahir early on. Arbil tried to control proceedings but the Ahal defence stood their group and they took the lead in the 29th minute when Alibek Abdurahmanov centred the ball from the left into the Arbil box that eluded goalkeeper Sarhank Mohsin and fell to Annayev, who hammered the ball into the open net. Arbil got back on level terms two minute later when they exchanged some neat passes in the box before the ball fell to Salah, who swept his shot home. There were few chances in the second half but the home side would grab the three points at the death when Myrat Hamrayev’s long throw-in picked out Annayev who hammered the ball into the net from seven metres. “We came here to win, but we couldn`t do it,” said Arbil coach Ayob Odisho. “Our players tried to beat Ahal but our opponents scored first and although we equalised very quickly, we had some problems creating chances in the second half and we couldn`t play with all possibilities. Doha: Arbil, runners up in last year’s AFC Cup, crashed out of the 2015 edition of the competition when a 0-0 draw with FC Istiklol on Wednesday left the Iraqi side adrift at the bottom of the standings in Group C.
The Iraqi side needed a win to keep their hopes of advancing alive but, despite putting the visitors from Tajikistan under pressure, the two-time finalists missed out on picking up the three points required. The draw means Arbil have just four points, four adrift of second-placed Istiklol, who can now advance to the knockout rounds with a draw against Ahal on Matchday Six in two weeks’ time. “We were the better side in the match but we didn’t score the chances that we created, which should have helped us to win and get the three points,” said Arbil’s Ahmad Salah. “We gave a good performance in the first half but we didn’t take advantage of our dominance. Arbil’s best chance to secure the win came six minutes from the end when, having subjected the Istiklol defence to increased pressure, Nabeel Sabah struck a free kick that forced goalkeeper Nikola Stosic to push the ball wide for a corner. Just one minute later, Arbil went close again when Mohammad Jaffal sent in a cross that Ahmed Mohammed sent over the crossbar from close range. “The result was not bad because we achieved our target,” said Istiklol coach Mubin Ergashev. “We wanted to have a good balance between defence and attack and we were basically looking to avoid conceding any goals and we achieved this tonight. 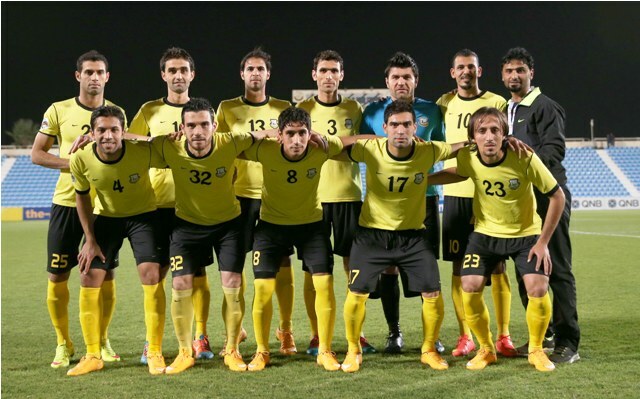 Kuwait City: Goals from Luay Salah and Mohammed Khalid ensured Arbil avenged their loss in last year’s final to Al Qadsia by ending their 2015 AFC Cup campaign with a 2-1 win over the defending champions. The win was not enough to stop the Iraqis sliding out of the tournament as they missed out on one of the two berths in the Round of 16 from Group C and was just their second victory of the campaign. “We were hoping to advance to the knockout stage but our two matches against Ahal FC cost us six points,” said Arbil team manager Omar Salim. “We were hoping to join Qadsia in the next round but this is football and we had several conditions that affected us. Luay Salah put Arbil in front in first-half stoppage time when he controlled the ball with his chest before smashing it into the net, but Qadsia levelled just five minutes after the restart when Hamad Aman scored with a fine right foot effort. Just six minutes later, though, Arbil were back in front when Khalid powered forward before scoring from 20 yards with a shot that went over the line after hitting the crossbar. “The boys were affected mentally as they were thinking of the final of the local cup,” said Qadsia coach Rashed Al Bedaih. “The match was important for us as we were hoping to finish on top of the group but it wasn't easy to play in such circumstances.